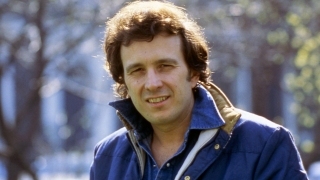 American singer-songwriter Don McLean poses in a London park in April 1982. McLean's original manuscript for his best-known song "American Pie" is going up for auction. Singer-songwriter Don McLean's original manuscript and notes to "American Pie" have been sold at auction for $1.2 million. McLean offered the wistful anthem that asks "Do you recall what was revealed the day the music died?" at Christie's on Tuesday. The NCAA National Championship may be over, but the "Late Night" bracket is still alive as Bellevue, Nebraska faces off against B Flat. Tune in Tuesday to see who wins the Tournament of Things. The 16 pages include the original working manuscript and typed drafts of the song. The eight-minute-long "American Pie" was released in 1971. It was a No. 1 U.S. hit for four weeks in 1972. "The day the music died" refers to the Feb. 3, 1959, deaths of Buddy Holly, Ritchie Valens and the Big Bopper in a plane crash. McLean, a longtime Maine resident, says writing the song was "a mystical trip into his past."